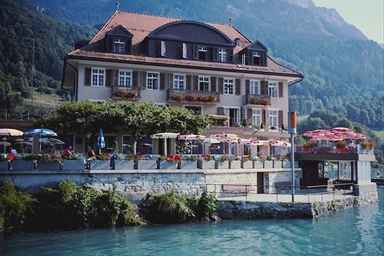 ABOVE: A hotel near the Brienz lake-steamer pier. The village of Brienz (2600 inhab. ), adjoined on the E. by Tracht, stretches for 1-1/2 M. along the bank of the Lake of Brienz, backed by green pastures dotted with fruit-trees, above which rises the Brienzer Grat, whence descend he falls of the Trachtenbach and the M�hlbach. Brienz is the centre of the Oberland wood-carving, which here employs about 600 persons, and of which specimens may be bought at Ed. Binder & Co's and Gebr�der Huggler's. The Wood Carving School deserves a visit. On a hill about 1/4 M. further to the W. is the Church, with a carved altar of 1517, commanding a view of the Sustenh�rner in the background. So what's changed in the last 100+ years? Not much. Huggler Woodcarvings is still in business, visitors continue to enjoy hikes and lake excursions, and the steam-powered cogwheel railway ferries tourists to the Rothorn's summit as it has done since 1892. The Brienzersee, or Lake Brienz, is one of the town's main attractions. The crystal-clear lake measures 8-3/4 long and 1/5 miles wide (15 x 2.4 km), with a maximum depth of 860 feet (262m). It's surrounded by forested mountains on all sides, giving it a wild and brooding quality that contrasts sharply with the well-tended atmosphere of Brienz and the other towns along its shore. And Brienz does feel domesticated--as it should, having been inhabited for the better part of a thousand years. The local church dates back to the 12th Century, and some of the town's houses and hotels were built in 1600s. Even the modern chalets look as if they might have been built a century or two ago, with their traditional overhanging roofs and heavy wooden balconies. Brienz is a classic Bernese Oberland resort--and if that means the atmosphere is a bit touristy, so what? Tourism has been a part of this region's culture since the British and Germans began coming here in the middle of the 19th Century. Swiss Open-Air Museum. The Freilichtmuseum Ballenberg has some 80 typical houses and farm buildings from all over Switzerland scattered across its alpine pastures. Traditional crafts are demonstrated by costumed workers during the season, which runs from mid-April through October. Admission is 12 francs for adults, half-price for children. Giessbach Falls. You can drive to the Giessbach Falls, or--better yet--take a boat from Brienz. A funicular (opened in 1879) hauls you up the rocky hillside in four minutes, or you can hike 20 minutes to see the seven waterfalls that total 980 feet (278m) in height. Check Brienz hotel, B&B, and chalet rates at our partner, Booking.com, which is Switzerland's most popular reservations service. Interlaken's tourist office presents a limited array of visitor information in English. The Hasli Valley's multilingual tourism site covers the area between Lake Brienz and four mountain passes: the Grimsel, Susten, Grosse Scheidegg, and Br�nig. This site for local residents is in German, but you can translate with Google if you're curious. Brienz is on the railway line between Lucerne and Interlaken. For schedules, see the Swiss Federal Railways journey planner. If you're coming from Interlaken during the June-September boat season, we recommend taking a BLS lake steamer on Lake Brienz. Boats sail frequently from Interlaken Ost throughout the day, and the journey lasts about 1 hour 15 minutes. Pilot-photographer André Locher's photo is small, but it shows the town's layout. This long-popular festival takes place near Brienz, in the Bernese Oberland, in early August. A free shuttle bus runs to the festival site from the Brienz railroad station.